Because Racecar? No, Because "oops"
This morning we had 4.5" of wet, sticky snow at home, and JUST before we left the house, the town truck came around and plowed half our cul-de-sac, leaving a) a nice area for me to play in on the other side, and b) a huge snowbank in the middle. The kids were SO excited to do donuts in the car, which I delivered. Then they wanted to bust through the tall snowbank again, and it was still soft enough, so I went driving down the middle of it, but a little sideways. Well, the wheels on the plowed part of the road hooked up just long enough to straighten the car as I lost momentum; next thing you know I’m high-centered. It’s raining pretty hard and I really don’t want to spend the next 20 minutes on my knees digging snow out from under the car. I pondered my choices for a few seconds, then remembered that one thing I didn’t get to do over the weekend was to put away the truck. I don’t love it being covered in snow and I can’t drive it on the roads now with the salt. 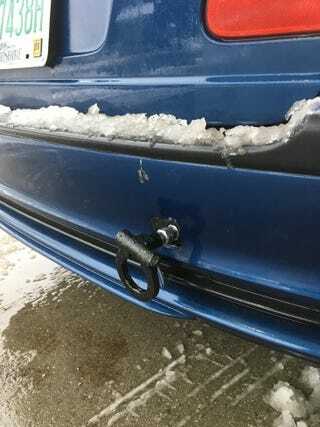 But I sure as hell can yank my car out of tiny snowbank with it! What could have been a real hassle was only a 5-minute delay. The kids were in my car as I pulled it free and they thought it was the best thing ever. This is after we used the truck this weekend to pull down a standing dead oak tree, which they also thought was the best thing ever, at the time.